Last spring I wrote about a photographic exhibit Live for the Moment. The exhibit, based on a study by Dr. Genevieve Creighton at the University of British Columbia, showed how young men used photography to deal with the death of a friend. The study continues with an exhibit this month in Whistler, BC, with photographs taken by a group of men aged 19-25 who each lost a friend to accidental death in the past year. What Dr. Creighton found was that even in the broad category of “accidental” deaths, there was a wide range of circumstances as well as responses. The community responds differently to accidental deaths “on the mountain” (skiing or snowboarding) than to those off the mountain. The latter, at least in these examples, tended to be drug or alcohol-related. So, a young man could mourn his friend who died in an avalanche and be proud of him. But if he died of hypothermia, passed out in a snowdrift after leaving a bar…well, that evokes a very different type of grief. Some of the men in the study were addressing their grief for the first time. A few had already been lucky enough to reach out and accept support from those around them. But as I found in my own research, it’s not just that men tend to be instrumental grievers: focusing on “doing” something rather than talking about it. That’s the stereotype because most men are not encouraged to talk about their grief. So this was a unique opportunity that they embraced. Matt Gore, whose friend died in that snowdrift, used the study as a chance to give back, to help others dealing with the same type of grief. That friend’s death made him quit drinking and try to help others avoid the same fate as his friend. A separate group of young men – who did not participate in the exhibit – lost friends long ago. Long-term, they handled it in different ways. Some saw that death as a wake-up call to focus and appreciate their own lives, friends and relationships. Others seemed permanently stuck, unable to “grow up” past the time when their friend died. Creighton’s study points out the need for informal grief support services for young men. 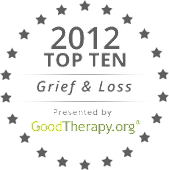 One of her most fascinating suggestions is for health care providers to train coaches, instructors, bar and restaurant managers to recognize and counsel those who are grieving. Granted, her subjects live in a ski resort town, the type of community that does not like to discuss anything as negative as a young man’s death – particular if it’s related to their major industry. But I think the idea of training those in closest contact to these young men is one worth discussing in a larger forum.